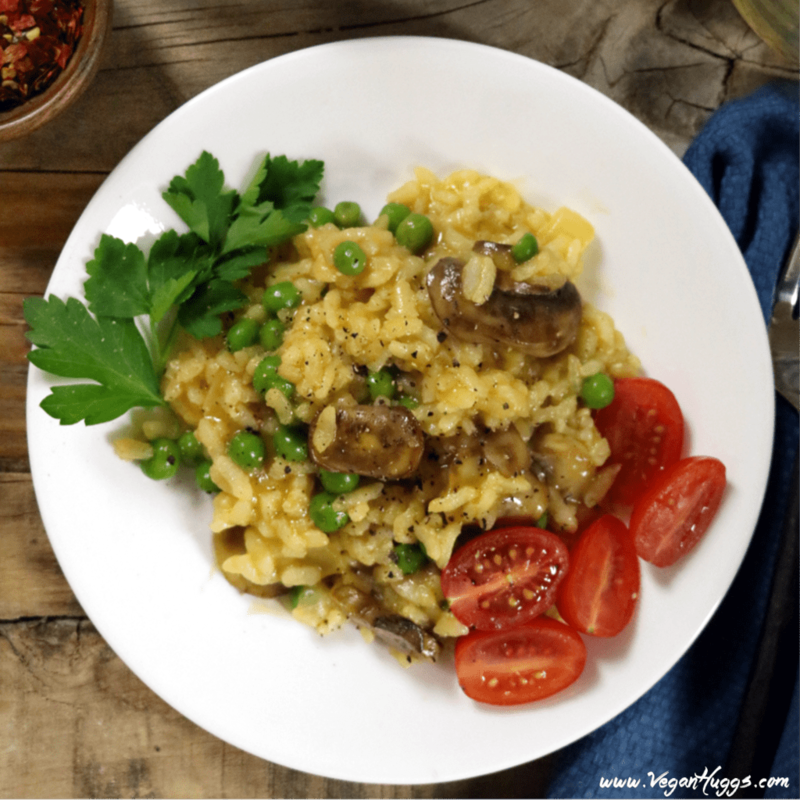 This Vegan Mushroom Risotto is so rich & creamy, but it doesn’t have any cream. It’s comforting, cozy & oh-so satisfying! Yep, you’ve read that right – no vegan cream at all! 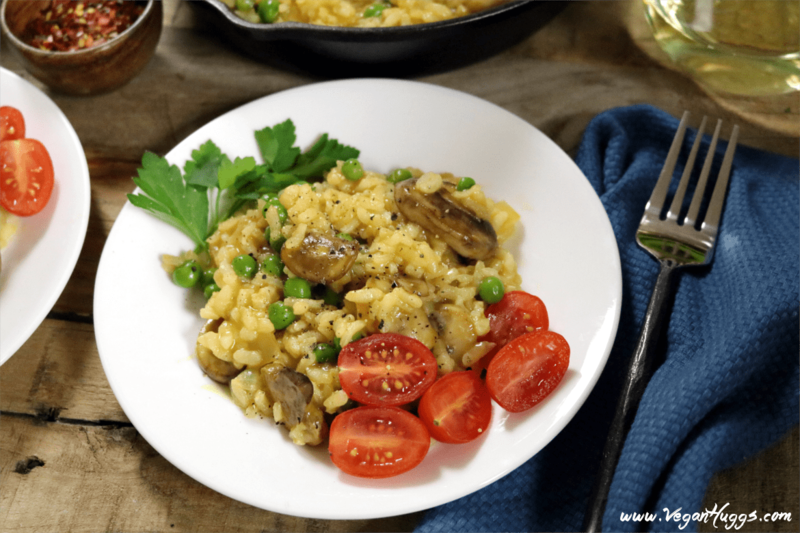 I’m not against using cream in recipes, but this Vegan Mushroom Risotto just doesn’t need it. 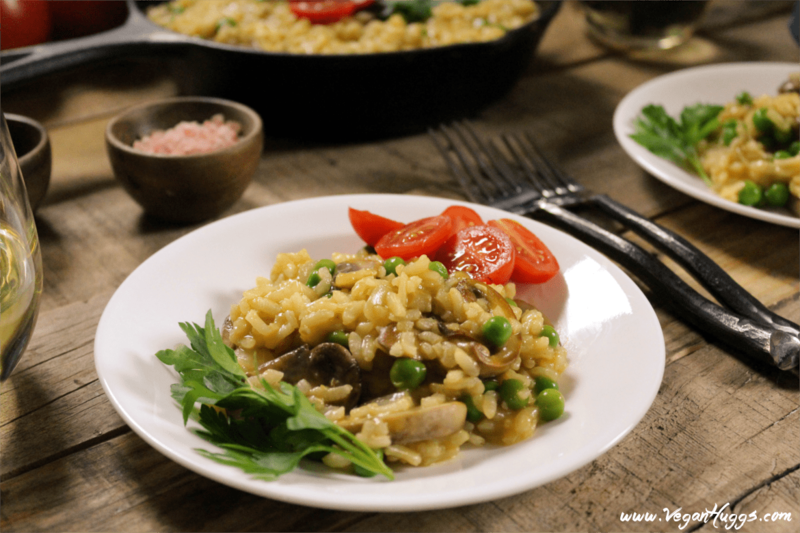 It’s entirely creamy on its own from the Italian-grown arborio rice. A traditional Italian risotto doesn’t include any cream because the creamy texture comes from the rice itself. The kernels contain a high starch content which creates a dreamy & luxurious texture when cooked. When it comes to comfort food, Italian-style dishes are my favorite (right next to Mexican food). I often make this Italian-inspired Eggplant Rollatini and these Fried Olives Stuffed w/ Roasted Garlic. I love the garlic in Italian recipes, so I always have Roasted Garlic in the fridge. It takes things to another level. Risotto is famous for its rich, savory and satisfying feeling. It’s buttery, filling and has a wonderful bite to it. It’s cooked to a perfect al dente texture, which leaves it velvety soft, but still with some bite (not mushy at all). This dish will get your taste buds tingling and your belly warm & happy. The basic ingredients for Risotto are arborio rice, broth, onion, wine, and butter or oil. Most likely you’ll have everything in your kitchen waiting for you now. If you don’t have arborio rice, most grocery stores do carry it. You can also find it on Amazon. They have a big selection and you can even buy it in bulk packaging to save money. Most traditional risotto recipes call for parmesan cheese (except for the seafood variety) but it’s not 100% required, and it can easily be replaced with vegan parmesan. I really like this dish without it though. I feel like cheese can sometimes overpower the delicate flavors of the vegetables and take away from the savoriness of the dish. However, feel free to add some vegan cheese if you prefer. You can also use nutritional yeast for cheesy flavor. Risotto can be made with a rainbow of different vegetables. I try to use what’s in season or whatever I have in the freezer. 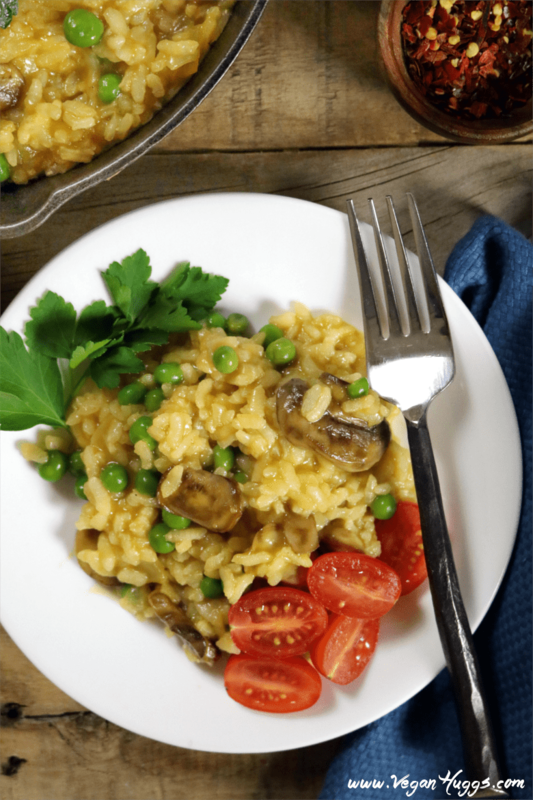 For this recipe, I kept it really simple…I used cremini mushrooms and frozen peas, but you can add your favorites to make this dish your own. Risotto can take some time, but it’s really simple to make. There are many different flavored risotto recipes, but the technique is primarily the same. 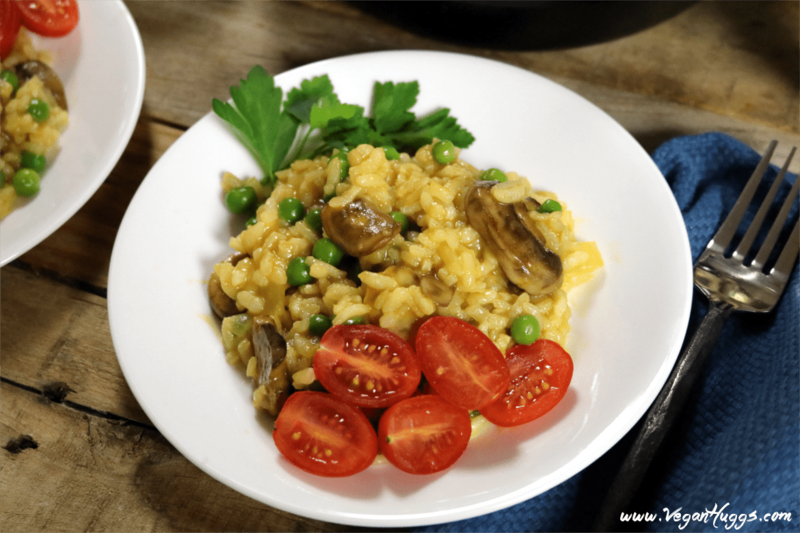 This Vegan Mushroom Risotto is basic, but a super tasty recipe for you to start with. Once you get the hang of things, you can experiment with more. All you’ll need to do is place the peas in a bowl of filtered water to thaw out. Now sauté the mushrooms in olive oil, garlic, and thyme & set them aside. It’s best to cook vegetables outside of the risotto and place in near the end. This avoids mushy vegetables and their flavors taking over the dish. When the wine is evaporated, you’ll begin adding hot stock to the pan, one cup at a time until it’s gone. Let the broth cook down before adding more. You probably won’t need more than 6 cups, but have some on hand just in case. Stir often, but not constantly or it won’t cook properly. Stirring is important because it helps release the starchy molecules into the broth, creating a smooth & creamy-textured liquid. The rice should be tender but have a slight bite to it (al dente). Add more broth if needed to reach desired tenderness. This whole process could take between 20-30 minutes. Remove from heat and add the peas, mushrooms, lemon juice & fresh ground pepper, stir to coat. Taste for seasoning and add more if needed. If you want to add cheese flavor stir in 2-3 tablespoons of vegan parmesan or nutritional yeast. Traditionally, a few pats of butter are stirred in at the end, so feel free to add some vegan butter to add more richness. In Italian tradition, risotto is served during the first course (primo), and sometimes on the side of the main course. However, I usually serve it as a main dish, with a salad on the side. I like it with a light vinaigrette dressing, so it doesn’t overpower the risotto flavors. Now you’re ready to have a restaurant-style, Italian dish in the comfort of your own home. 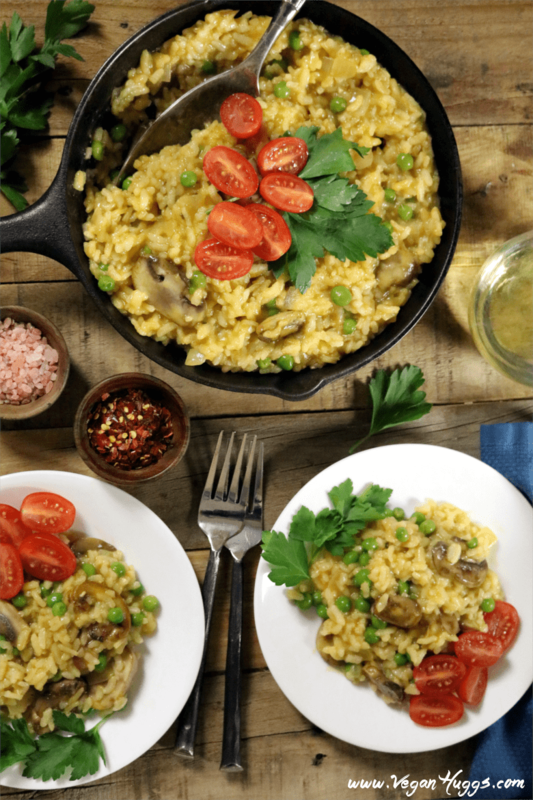 If you make this Vegan Mushroom Risotto, I’d love to get your feedback. You can leave a comment below and let me know what you think. It would really make my day. You can also follow me on Instagram and share your creation with me. Just tag me @veganhuggs and hashtag #veganhuggs so I don’t miss it. 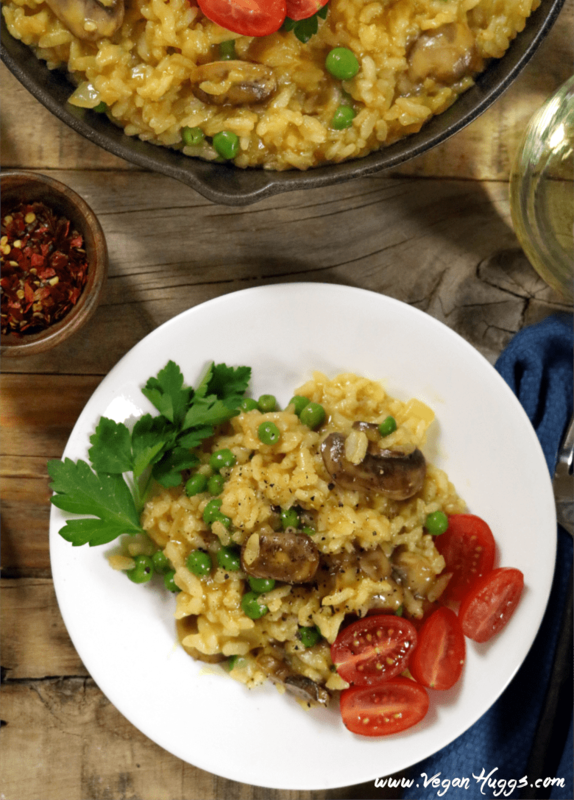 This Vegan Mushroom Risotto is so rich & creamy, but it doesn't have any cream. It's comforting, cozy & oh-so satisfying! Pour broth in medium pot & bring to a simmer over medium-high heat. Now reduce heat to medium-low to keep warm. In a large pan over medium heat, add 1 tablespoon olive oil. When heated, add mushrooms and sauté until the liquid evaporates (about 3 minutes). Now add 1 clove minced garlic, thyme & a pinch of salt. Sauté until the mushrooms are tender & lightly browned. About 3-5 minutes. Remove mushrooms and set aside. Wipe out the same pan and return to stove over medium heat. Add butter and oil. When melted & heated, add diced onion & remaining minced garlic. Sauté until onions are translucent. About 3-4 minutes. Add rice and stir to coat. Let it toast for 2-3 minutes. Add wine and turn heat up to medium-high to simmer. Once simmering turn heat back to medium. Cook wine down, about 3-5 minutes. Stir often. Add one cup of hot broth and salt. Let the liquid lightly simmer and cook down before adding more. Stir often, but not constantly or the rice won't cook properly. It could take between 3-4 minutes for each cup of broth to cook down. Continue this process, until broth is cooked down and rice is al dente. The rice should be tender, but have a slight bite to it. Add more broth if needed to reach desired tenderness. This whole process could take between 18-24 minutes. Remove from heat. Add thawed peas, cooked mushrooms, lemon juice & fresh ground pepper, stir to coat. Taste for seasoning and add more if needed. Serve hot. Enjoy! *Wine: not all wine is vegan and may contain egg whites. However, there are many that are vegan. Here is a vegan wine directory. *Vegetable Broth: I like to use low sodium broth, so I can control the salt taste. Some broths are too salty and can ruin a good recipe. If you would like to use a regular broth, make sure to cut down the added salt in the recipe. Taste as you go along. Another option, is to blend low sodium and regular broth together. **You probably won’t need more than 6 cups of broth, but have some on hand just in case. I usually preheat about 7 cups of broth in the pot. *Don't cook rice higher than medium heat, or it will cook to fast and become gummy. *If you want to add cheese flavor stir in 2-3 tablespoons of vegan parmesan or nutritional yeast after removing from heat. Traditionally a few pats of butter are stirred in at the end too, so feel free to add some vegan butter to add more richness. Stir gently to coat. *Consistency of Risotto: The risotto should be able to move on the plate & It will slowly spread on its own. You don't want it to be too runny though, or have excess liquid around the perimeter. You also don't want the consistency to be thick like sticky rice either. Find that happy medium for a perfect risotto. This risotto was so amazing! The whole family loved it. Thank you! It should be noted that I am not the house chef (my husband is a thousand times better in the kitchen), but I have been making an effort … this recipe came together beautifully since my first attempt and has become a regular in our house. It is also easily halved for just the two of us … thank you so much! Thank you so much for sharing this recipe! My family absolutely loved it! Will go into my “make again” recipe file. I’ve made this recipe 3 times now and love it. Adding an extra tablespoon of vegan butter at the end does increase the creaminess. It is great with our garden-fresh cherry tomatoes. This past time, I added some fresh basil once it was plated and it was a great addition. I’m thinking of trying asparagus instead of peas next time. What are your thoughts on that? Hi Kara, This is so nice to hear! I’m glad you like it. Sounds so good with garden tomatoes (mine didn’t do well this year) and I love the addition of basil. Yes, you can totally try it with asparagus. You can try it two ways. 1- Add it with the last round of vegetable stock. You may need to turn the heat up a notch, but be careful not to burn (add more stock if needed). The asparagus will be tender-crisp. 2- If you want it more tender, you can sauté the asparagus beforehand and add it at the end. Sauté with butter, salt, a squeeze of lemon and fresh garlic if you’d like. Hi Melissa — I tried the recipe with asparagus tonight. I followed your recommendation to saute it beforehand and add it at the end. It turned out great. However, I don’t think it was significantly different than using the peas. Since it required an extra step and I’m a lazy cook, I’ll probably stick with the peas going forward. Hi Kara, I’m glad you tried it. Lol! I’m a lazy cook too, so I guess I’ll stick with the peas 🙂 Thank you for sharing. Have a great week! Tthis was sooo tasty!! Great recipe even without parmesan. Also, just wanted to mention that I appreciate that you’re just going to send out emails once a week. Hi Tina, thank you for stopping by. I’ve never tried risotto in a pressure cooker, but I would love to give it a shot. I’d love to hear how it turns out for you. Thank you for the feedback on the emails…I’m glad the schedule is better. 🙂 Have a great weekend! 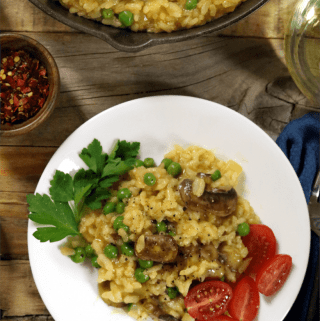 Hi, this recipe looks deli!…I love Risotto. I always use cashews to add “creaminess”to any dish and it works !! !..I will add a 1/4 of a cups of cashews and nutritional yeast to a cup or two of the broth and it might add creaminess to the dish…any thoughts? thank you Melissa, yes I was thinking in adding the cashew cream at the end just to give it a bit more creaminess. The vegan heavy cream is a good idea!..any brand you recommend. I personally do not like to use on savory dishes coconut cream. I use it for a lot of other dishes though. 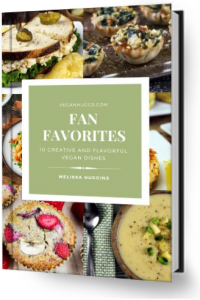 I will certainly let you know!,,your recipes are great and easy. I share your recipes in my Pinterest board..